On Mentoring / Only Connect... ~ Ron Samul, M.F.A. This week, I've been thinking about the role of the mentor. I understand my official role as a mentor. But I feel like it has taken me some time to develop what I can do for students who connect. I am not the line editor, although I can pick out places where I think the writing needs work. I am the mentor who connects. Perhaps it is partly from the obsession I have with E. M. Forster's epigraph at the beginning of Howard's End that says simple "Only connect...." and he adds three pesky ellipses that just don't connect. Ugh! That idea is like a hand grenade in my brain. It is such a simple puzzle: elegant, beautiful, and sad. This relates to my mentoring philosophy. I want to find ways to enhance the likelihood of the writer writing. That is my job. I don't want to judge a student's creative move - I want to prove its worth. I don't want to change the book, I want to strengthen the reason for writing it. It is in this realm that I've done the most prolific searching about the worth of writing, thinking, and creating. I've pushed myself to say something relevant and important about writing that I would never have considered without the help of the student's work, ideas, and connections to the world. And the result is when the ideas flow back with the same intensity. Every student that I've worked with on writing, thinking, and creating has been a direct and formidable challenge to everything I know about writing and thinking. For that, I am grateful to who I've become as a mentor and teacher. But more importantly, I am amazed at how important it has been to value a good mentor as a student and turn that value system into something sustainable as a teacher. Being a mentor isn't about control - it isn't about the words on the page - it is about listening, trusting, and waiting. In May, when I went through the Rhizo15 MOOC and challenged my own teaching style, I gave some students a chance to find their own paths, their own challenges, and their own results. That is when I saw something I had been waiting for as a teacher for a long time - inspiration. Students went out to the world and took on roles bigger than their experience. They saw themselves as model students who were sent out to work in meaningful and thoughtful directions. And they were given a trust that was tacit between instructor and student. This forging of teaching relationship based on letting go, empowering students, and seeing immediate results gave me new hope for the way I see the world of teaching. I did it again this semester - and empowered the students. And they also impressed me. Not only did they show me how to be independent and expansive in their learning, they also attended every class (which they weren't required to do) and participated in the classroom environment. Amazing. Give the students more freedom and they over perform. But is that freedom? Or did I merely acknowledge their potential and they stepped into that potential? I've made an analogy in class to content and form as coffee and a cup. The coffee is the content of the paper, but the form and function is contained in the cup that holds the coffee. In terms of a metaphor, it has come in handy in sharing the idea of whether I cam discussing form or content when they are co-mingling in the rhetoric of writing. Yet, when it comes to mentoring and giving students freedom, I can make the same type of metaphorical statement. If we can value the work the student does as the coffee, what I think is more important is what that cup looks like. That is where I can see skills worth having - discipline, motivation, tenacity, perseverance, grit, and all those qualities that change a person through hard work. How you will make it through this project, this paper, this novel -- is the coffee. How you will change over the course of doing it - that is all cup. And it is the thing that I want to change. I don't want to change the creative choices that student makes. That comes with practice, instinct, and writing style. But I can push a student to think deeply, and not settle. I don't want to change the creativity, but the way they think about it. 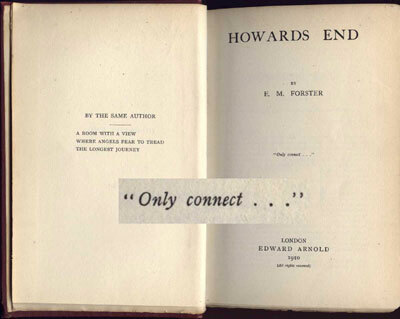 Sometimes, I think Forster posed the epigraph "Only connect...." as an ironic statement of the modern age. And I use to revel in that sense of tragic loss and disconnection. But sometimes, I wonder if he left the phrase unfinished because we never complete the act of constantly connecting. There is always more work to do. There is always more to discuss. No one enters into art because they aren't thinking and processing the complexities of the world. And so, it would be ridiculous that mentors and teachers would recycle their pat advice from one student to another, without seeking out deep and meaningful connections to that of the student's art. Giving meaningful and connective vision to a writer (seasoned or student) is some of the most important work. It might be the first time they have spoken to their art with such depth and focus. It might be the conversation they've been waiting for their entire life. I was sent an email this semester from one of the students that worked on an independent project for me in the spring. She moved to a bigger university, finding her path in a different realm. She asked me to read over her essays on the ambition of woman in the community based on interviews she did with them. The project was still moving forward, even when courses and life changed, it was still happening. "Only connect...." didn't have to mean ironic wordplay, but a continued sense of perpetual motion - always connecting - one idea, one student, one vision at a time; never stopping. As a teaching philosophy - that is all I can be as a mentor and a writer. Simply complex.